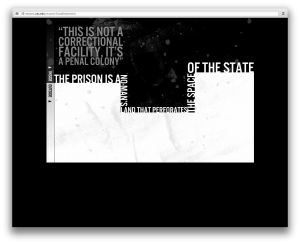 «Public Secrets» is a collection (what Manovich would call a ‘database’) of bits of sound recordings of interviews with inmates in a California women’s prison. The bits are linked together by various means, but the main listening experience is one of random browsing, assembling a mosaique out of sound bites ranging from 45 seconds to 3 minutes. The piece was recognized as an Official Honoree in the Activism category by the 11th Webby awards. 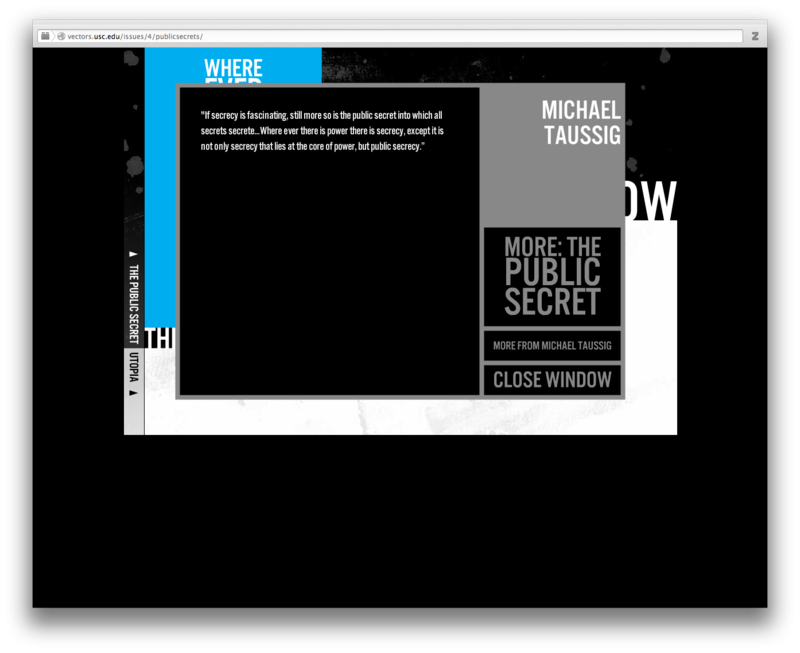 «Public secrets» opens with an explanatory screen and an «enter» button. A short indtroductory talk by Sharon Daniels, the author, plays back before one of the three main overview screens appear. 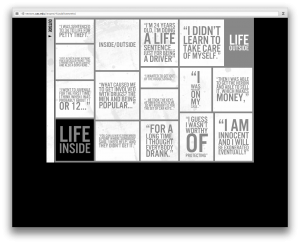 These overviews are constructed as oppositions: Public secret/utopia, Inside/outside, bare-life/human life. In each of the screens, pull qotes appear and disappear. When clicked, a sound clip is played back. It is thus possible to spend a lot of time in the overviews following the (probably random) sequence the clips appear in. Other sequences are also possible. Users who click on a pull quote are offered a link to see more, which leads to a more static kind of overview, where up to twelve pull quotes are offered as graphic table of contents on each page. In fact, each thematic collection contains closer to fifty sound clips, as the «more» link reveals another overview page, which again is linked to yet another. Clips may also be browsed by name and by relational links. 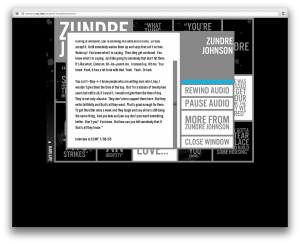 Clicking the «view transcript» link not only brings up a transcript of the audio file, but also a link to an overview of all clips from the same interviewee. Clicking «view connections» opens a different kind of visualization, where boxes representing other clips and overviews, presumably related in some way, drift around. A small number of links are not to sound clips, although they appear similar, but are written quotes from theorists. I spent more than two hours with the piece, and listened to several dozen sound clips, but could not cover it all. I was thus not able to judge how many clips the work actually contains, or how many women who were interviewed. «Public Secrets» is like most projects published by Vectors. It is a curated collection of material that can be browsed in a sequence that is somewhat controllable by the user, but mostly defined by connections and algorithms laid down in the piece. In this case, pull quotes seem to be selected randomly in the top-level overviews. Each sound clip is coded as related to several overviews as well as individual other clips, but these are not explicitly shown. There is few navigation tools and no back button, and as the only link markers are short pull quotes, the user has to move rather in the blind. Still, an argument slowly uncovers, not unlike a picture appearing in a jigsaw puzzle. Taken together, the sound clips tell much about judges giving very long sentences, an intricate and often random penal system, and a humiliating and dehumanizing prison experience. A few scholarly works are cited, explaining the concept of a «public secret». «Public Secrets» is a captivating and touching work, more akin to the documentary genre than to scholarly argument.